A new kind of press release for a new kind of journalist. The traditional format of page-long text inside a PDF doesn't cut it anymore in this day and age. For a company's news to spread across the social web it needs to be easy to skim, very easy to share, if possible include multimedia such as images/videos, and up-to-date contextual information to the last minute. All things the traditional press release generally isn't capable of. Today, after a couple of months of private beta testing with companies such as 123people, Heinz, Selexyz, Multiscope and The Next Web, PressDoc opens its doors to the public. Now, every company, big and small, will be able to write, edit and publish a press release that will find its way onto the web and increases the likelihood for bloggers to cover their announcements. Optimized for sharing via social media such as Twitter and Facebook. Enrich your press release with images, videos and documents. Scheduled distribution; set a date and time and it will be published automatically. Detailed analytics on who's reading your release and what they are saying about it. 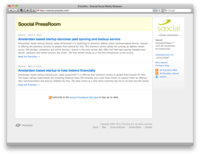 All your press releases in one place with PressRooms. 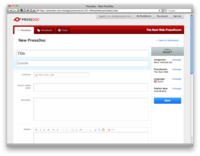 Integrate a basic version of the PressRoom into your site. 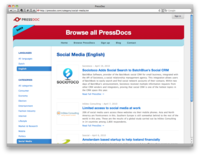 Every company will get a free online PressRoom listing all their PressDocs. User can created multiple PressRooms for their different companies. A great way for PR agencies to create a separate PressRoom for every client! In the near future it will even be possible to create a shared PressRooms which makes it possible for e.g. events to invite companies to publish their PressDocs within their shared PressRoom which will then be communicated to the media. The Next Web Conference PressRoom is an example of such a PressRoom. 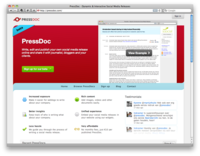 Signing up for PressDoc is free, there are no monthly costs. You only pay for what you use, and therefore you only pay € 10 for every published PressDoc. Launches today, sign up now! Sign up for free and see how easy it is to write your own PressDoc!